I’m arriving at the most somber site I've seen in Vietnam. It seems to be a temple, but it's really more of a pagoda. Vietnam has many picturesque pagodas, but this one I’m approaching is unique. From a distance, it looks more like a modern, open air art pavilion. It’s blue Asian rooftop slopes inversely, dipping lower towards the center. A flamelike sculpture protrudes above. There are no walls, simple white beams support it. Climbing the steps, I come to a small altar fronted by a large stone urn. Within are the numerous sticks of burning incense, left here by the Buddhist faithful in remembrance of departed souls. I hear the familiar sound of flute music, but unlike the pagodas in the city, this isn’t a recording from a loudspeaker. A barefoot young man sits nearby, playing a soft and somber tune. In the middle of the pagoda, gem shaped sculptures encircle the center. They are tall and identical, with each golden gem bearing the image of a spiritual flame. I look between the gaps of the gold sculptures, and see the contents of the enclosure in the center. Within the glass windows, are human skulls. Their dark, blank eyes look outward at those peering in. Skull after skull is stacked next to each other, and on top of each other. Row after row, shelf after shelf. A small sign at the bottom lists the contents of this group of remains. “ADULT FEMALES OF BA CHUC FROM 21 TO 40 YEARS OLD”. Marks on some skulls give evidence of how they died. Some have bullet holes. Other skulls are cracked or shattered, from having been clubbed to death. One has a deep cut across the brow from what may have been a machete. Circling the grim enclosure, there are more skulls, of men, women and children. One group of 29 skulls is listed as “BABY OF BA CHUC UNDER 2 YEARS OLD”. Behind these stacks of skulls, is an enormous pile of human bones. The skulls may have been separated and carefully displayed, but it appears that the rest of the bones from these unfortunate souls were all just piled up all together. This grim site is known as the ‘Bone Pagoda’, in the village of Ba Chuc. There are many victims entombed in this memorial, but they weren't killed during the war with the Americans. Those that died here, were some of the first casualties of the war that came afterwards. When the communist rebels won in Vietnam in April of 1975, the communist rebels in Cambodia, known as the Khmer Rouge, were victorious only two weeks later. This area of the Mekong Delta, is less than five miles from the Cambodian border. Soon the Khmer Rouge began crossing the frontier to attack their Vietnamese ‘comrades’. Then then they came here, to Ba Chuc. On April 18th, 1978, Khmer Rouge fighters crossed the nearby border, and killed every person that they could find. By the time they left on April 30th, they had massacred 3,157 people in 14 communities around Ba Chuc. Their attacks were so murderously insane, that the Khmer Rouge killed not only ethnic Vietnamese civilians, but also many ethnic Khmers who already lived here. The reasons for these murderous attacks had nothing to do with communist ideology; for them it was a nationalistic fight to take back lost land. 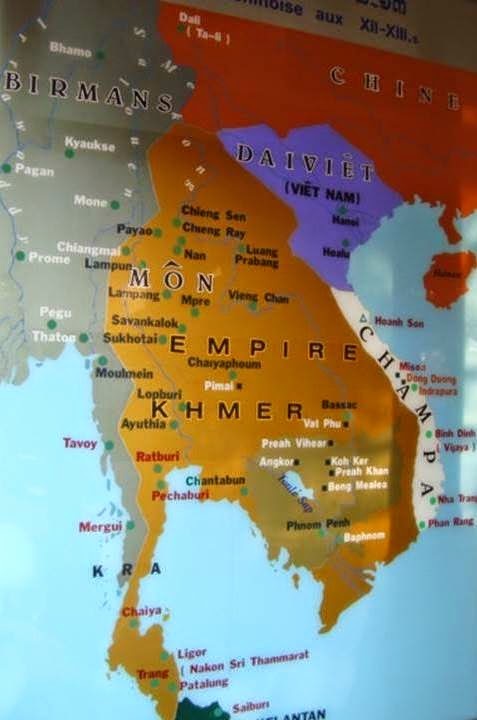 For centuries the entire Mekong Delta region, including what is now Ho Chi Minh City, used to be part of Cambodia. That changed in 1757, when the delta was annexed by an expanding Vietnam. Ever since then, the Cambodians have considered the Mekong Delta an occupied province. It is still known to them today as ‘Khmer Krom’, which means ‘Lower Cambodia’. Thousands of Khmers still call the delta home. On our way to Ba Chuc, we passed Khmer villages that were noticeably poorer than Vietnamese villages. The poverty and discrimination helped fuel the Khmer Rouge's hatred of the Vietnamese. When the Khmer Rouge came to power in Cambodia, their leadership decided it was high time for the delta to be returned to their control. The massacres in Vietnamese villages here and elsewhere, were all part of Pol Pot’s insane plan to take back the Mekong Delta, by force. These brutal attacks were a shock to many, since the Vietnamese communists and the Khmer Rouge had been supporting each other for years during their ‘revolutions’. The North Vietnamese Army had often fought alongside their Khmer Rouge comrades. They supported them with training, supplies, and weapons, until their relationship soured. Those very weapons were turned back against them here in Ba Chuc, and used against Vietnamese civilians. The Khmer Rouge had savagely bitten the hand that fed them. Most of the attacks occurred at night, and besides killing civilians, the Khmer Rouge destroyed every building that they could. Besides border villages, the Khmer Rouge even attacked and briefly held Vietnamese islands in the South China Sea. I leave the depressing pagoda, and find my translator Nga, who has taken interest in an old Vietnamese vendor selling roots and herbs. Nga selects some to purchase, and as we chat, I learn his story. Fearing for his life, he left the region. Tu wanted to come back for his family and cattle, but he was too fearful. Communication with his family was also a problem, since in those days, there were few phones in his nearby village of Phi Lai. A month later, the massacre happened. Tu lost his wife, his mother and an uncle. After Nga buys her roots, we ask Tu to accompany us. With his easy manner and kind eyes, I can tell Tu enjoys helping people, and he agrees to show us inside the community temple. This temple also has a horrific story from those terrible days. As the villagers fled the killing, some took refuge inside, hoping the Khmer Rouge would respect the sanctity of the temple. But it didn’t make any difference. Since the Khmer Rouge were violent atheists, they killed everyone inside the temple that they could. For years, dark blood stains were left on the temple floor, and there was a smell of death in the air. As we walk though the temple, I see that most of the blood has been cleaned up. Tu points out some remnants of the stains, that seem to resemble human faces. Years later, the walls of this temple room were repainted in a morbid way. Along the base of the wall are waves of red painted up from the floor. They are painted unevenly, like eerie red ocean waves. They symbolize all the blood that flowed here. We leave the temple, and head back by the vendors. Tu tells us that he later married again, and with his present wife he sells herbs and traditional medicines. As we are walking, he touches two parts of my back with his hand, saying that he can help me with back pain. I am momentarily stunned. I never told him I had back pain, and he touched my back in the exact locations where I’ve had back pain recently. How did he know? Before we leave, I stop in the local one room museum. The images within are disturbing. Grisly photos lining the walls show corpses lying where they fell in Ba Chuc. Eyewitness accounts from local survivors describe how they escaped the carnage. Among the displays are two US Army gas cans, the kind seen on the back of jeeps. The Khmer Rouge captured these and other US made equipment from the Cambodian Army. Later the Khmer Rouge brought them to Ba Chuc, and used their contents to torch buildings before discarding them. Strangely, both the Khmer Rouge and Vietnamese used captured US made materials and weapons against their former communist ‘brothers’. But when it came to firepower, the Vietnamese had even more captured US made weapons than the Khmer Rouge did. I recall a Huey helicopter I recently saw outside a Saigon museum. Captured from the ARVN, it had been repainted with the logo of communist Vietnam. When Vietnam invaded Cambodia later in 1978, that chopper went back into action. There were US made weapons being used by both sides of this new war. This use of foreign weapons makes me wonder. If there had never been any foreign arms brought into Southeast Asia at all, (from the US, USSR, China, France) what weapons would they have used here? Knives and bamboo spears? When Vietnam decided to invade Cambodia and remove the Khmer Rouge, disbelieving westerners never saw the war coming. This was almost inconceivable. Two communist armies, previously allies, turned on each other. These former friends were intent on annihilating the other. The rag-tag army of Khmer Rouge fighters had raised the ire of the largest, most experienced army in all of Southeast Asia. Their leader Pol Pon, as Pol Pot is known here, would be outnumbered, outgunned, and he would lose. As horrible as the Ba Chuc massacre was, history can say that these people did not die in vain. Their deaths influenced the Vietnamese government to invade Cambodia, and force the murderous Khmer Rouge out of power. When this attack happened here, it was the beginning of the end for the Khmer Rouge. The days of the Cambodia genocide were numbered. The border to Cambodia is open and peaceful now, but there are still some Vietnamese Army bases in use out along the delta highway. After what happened here, it seems that the Vietnamese never want to leave this area of the delta undefended again.